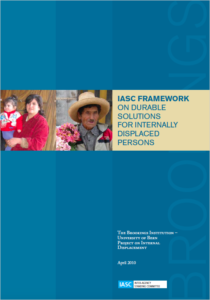 The 2010 IASC Framework provides a starting point by establishing the durable solutions definition as well as widely recognised criteria “to determine the extent to which a durable solution has been achieved”. In 2016, an inter-agency process was set up to operationalise the Framework. This process is led by the Mandate of the Special Rapporteur on the human rights of IDPs, and coordinated by JIPS in collaboration with a Technical Steering Committee comprising a broad group of partners engaged in supporting durable solutions to displacement. Members include DRC, ICRC, IDMC, IOM, FIC/Tufts, NRC, UN Peacebuilding Fund, Solutions Alliance Research, Data and Performance Management group members, UNDP, UN-Habitat, UNOCHA, UNHCR, World Bank, Displacement Solutions Platform and ReDDs. The project has so far produced the Durable Solutions Indicator Library as well as the Durable Solutions Analysis Guide, and if further working to elaborate guidance for comprehensive yet practical approaches to durable solutions analysis and monitoring progress in displacement situations.